Branislav Ivanovic will not face any action over his choke, throttle and headbutt on James McCarthy during last night’s game, but The FA have charged both Everton and Chelsea for failing to control their players following the altercation that occurred after Gareth Barry’s sending off. The decision went to a three man panel who did not deem it a sending off offence! They obviously didn’t see the same incident. 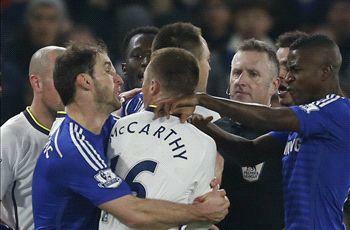 In some images it even looked as if Ivanovic was trying to bite McCarthy. “In Premier League matches, if an incident has not been seen by the match officials, a three-man panel of former elite referees will be asked by The FA to review it and advise what, if any, action they believe the match referee should have taken had it been witnessed at the time. “Both Chelsea and Everton have been charged by The FA for failing to ensure their players conducted themselves in an orderly fashion and/or refrained from provocative behaviour.